I saw this on ebay being sold by Branda Performance. 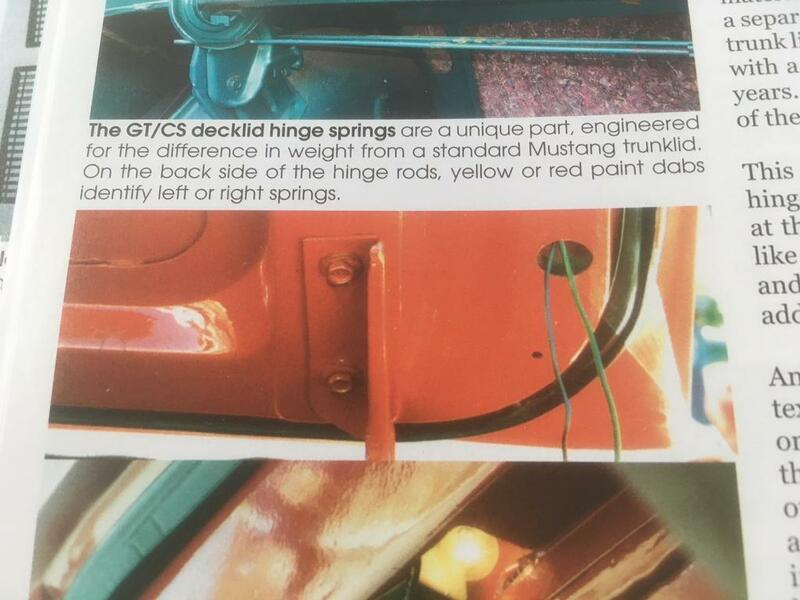 It states it is an 'early' fiberglass trunk lid for a GT/CS since it has the hand laid fiberglass and no trunk lid light. I had never heard of 'early hand laid fiberglass' on the '68 Shelby or GT/CSs, but could this be one of the '67 or early '68 convertible Shelby prototype trunklids? I checked my Feb 5 built GT/CS, and it also has the rough texture in the triangles on the bottom. I learned something new today. Does it have the hole for the light? I sanded on mine. It is rough and I thought they all were this way? Do we have a pick of a smoother one? Mine also has the hole for the light. Mine, well Don's (vetteslick) that is currently in my possession, has the rough texture and the rectangular hole for the trunk light, but of course, no trunk light. here is what the correct texture for the back side of the trunk. Do all the originals have that? I'm looking at another car and the deck lid texture looks right but it doesn't have a circular hole on the passenger side for the trunk light. I've been searching through the site but can't really find an answer. I see some decklids shown as original that don't have those holes. It’s a rectangular hole that faces the front of the car. As far as I know all deck lids should have the hole, but as with anything Mustang-related I can't swear to it. Ford did some goofy stuff back then. Last edited by Mosesatm; 09/11/2018 at 08:37 AM.. Thanks Arlie. Now I understand. I see that rectangular cutout on the driver side near the trunk latch. I was thinking about this circular hole referenced in the book. Most of the decklids I've been looking at that I think are original, don't seem to have this circular hole. I just looked at mine. Where the hole is where the wiring is shown, my car has a smaller hole, like the lower one in your picture, 68gulfstream. I believe the larger hole and wiring would be on a Shelby. Mine has an indent in the area where the hole should be. The hole should be on the other side. I have a July car and don't have any holes for anything. But it does have the texture. Tony Branda sells things that he claims are for Shelby's and CS or HC and states they are correct when they are not. Case in point I asked him a question on E-bay about some fog light covers he was selling, we got into a heated debate because he claimed they were correct and clearly they were not. I guess he got insulted because I called him out and asked me to stop emailing him and I asked him to stop lying. So do your due diligence with that guy.